cold description: When magnetic sensor on upper arm senses magnet on lower arm, blower is triggered, which inflates prosthetic bicep muscle. When a stretch sensor created with conductive fabric is stretched across the inflating bicep muscle, a sounding pitch becomes lower as the muscle becomes bigger. warm thoughts: Here, I’m playing with an interest in prostheses. In some ways, robotics (and technology in general) in our everyday lives already act as prosthetics. 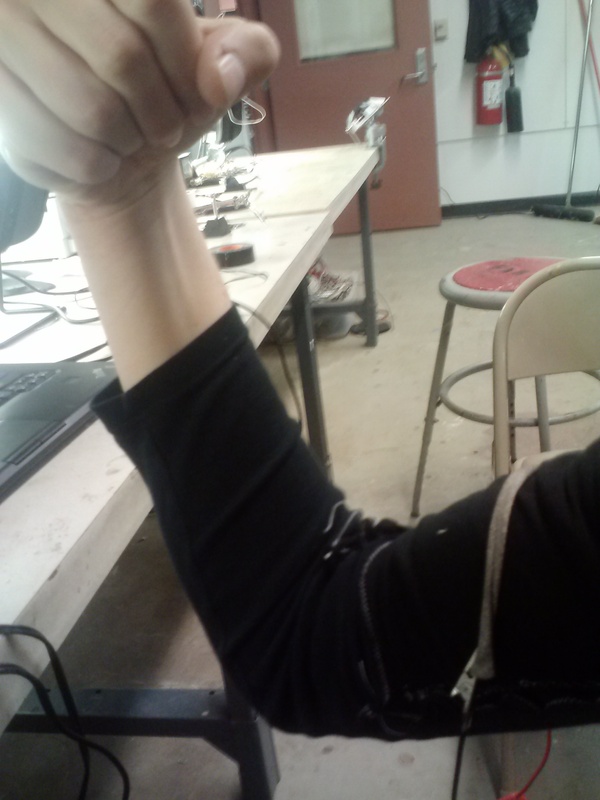 In this prototype for a 2-sensor 2-actuator system, this symbiotic relationship between humans and robotics technology is (perhaps reversed) and reflected as a non-functional, cosmetic flex of the human muscle. In relation to biomimetic robotics, this set up is somewhat reflective of an ectosymbiotic system.